If you’re one of those people who seek out microbreweries wherever you go, you’ll be happy to know that even way out here in the Pacific you can find a good brew. Whether your trip brings you to Oahu, the Big Island, Maui, or Kauai, seek out locally flavored ales, IPAs, and porters at these island brew pubs. 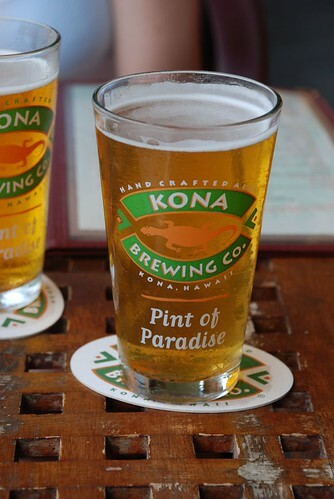 Kona Brewing Co. – With locations on the Big Island and Oahu, you’ve got two chances to try the fine brews from the folks at Kona Brewing Co while you’re in Hawaii. The brewery is located at the Kona facility where free tours are available. The pub on Oahu is outside of the bustling Waikiki area in the Koko Marina Center. The Pipeline Porter is a must-try if dark beer is your thing: brewed with 100% Kona coffee grown on the Big Island, the distinct coffee flavor might tempt you to switch up your morning routine. Big Aloha Brewery – Famed island restaurateur Sam Choy brings plenty of aloha to his dining establishments, but you might be surprised to learn that he does beer, too. Big Aloha Brewery situated within Sam Choy’s Breakfast, Lunch and Crab location, features a variety of beers from brewmaster David Campbell. Of note is the Kiawe Honey Porter, brewed with locally harvested kiawe honey. Monthly brewer’s dinners feature a five-course meal and a chance to try six different brews. Maui Brewing Co. – How can you go wrong with a Bikini Blonde? That’s just one of the brews on tap at the Maui Brewing Co. pub. Their award-winning Black Pearl is a coconut porter aged in rum barrels, with notes of dark rum, toasted coconut, and molasses. Sounds like the perfect beer for Captain Jack Sparrow and his crew, doesn’t it? Waimea Brewing Company – Located on the island of Kauai at the historic Waimea Plantation Cottages, the Waimea Brewing Company has about eight different beers on tap at any time. Choose from Waialalale Ale, named for Kauai’s famously wet mountain where average rainfalls top 425 inches each year. Enjoy your ice cold beverage with creative multi-ethnic pub fare, including fish dishes and island style pupus (hors d’oeuvres). Sixty-four ounce growlers are available if you’d like to take your beer to go. Love microbrews. There is one here that calls itself the second largest brewery in Golden, CO. It’s an inside joke because the Coors brewery is a few blocks away. Like Roxanne, I LOVE microbrews. I hope to visit ALL these places sometime soon! I confess I’ve never been to a microbrewery. (Not a fan of beer). However, I’ve decided that I need to visit all of the above. 😉 Oh, Ok.. I really just want to come to Hawaii.. my husband would LOVE to see these though. Another good reason to visit Hawaii! My husband loves to try the local beer wherever we go.